Go Displays have been working with charities and non-profit organisations for many years and now we would like to give something back. Seeing some of the work done by charities, educational organisations and other good causes is always humbling, so now we would like to do our part to help. We will provide a FREE Switch Banner Stand or Event Table Top Display Board to registered charities, schools and non-profit organisations who apply. 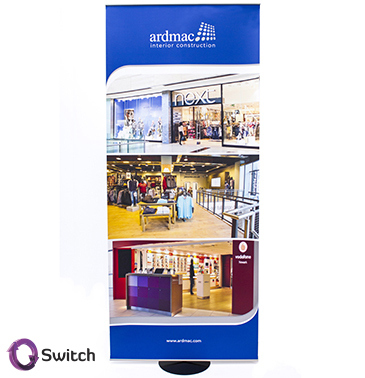 The Switch banner is designed to be a versatile tool which you can have on hand whenever you are promoting your organisation. What makes it unique is the replaceable panel, allowing you to change the design if required without having to replace the stand. Banner Stands and Display Boards can help to spread the word of your cause and they are perfect for brand promotion, event advertising, fundraising or for any other purpose. With any luck, this will help to raise awareness of your cause! Both the Switch Banner Stands and Event Table Top Display Boards are designed, manufactured and printed here at Go Displays. Please apply by filling out the form below.